Ghana has signed a memorandum of understanding with the Federal Republic of Germany to establish the German-Ghanaian Business Council. The establishment of this council will facilitate the exchange of information and views on economic cooperation, trade and investment. It will promote industrial cooperation on Small and Medium scale enterprises and also collaborate on matters of mutual interest in respect of multilateral trade negotiations. The Minister of Trade and Industry, Mr. Alan Kyerematen signed a memorandum of understanding with the Federal Republic of Germany, represented by Mr. Thomas Bareib, a Minister of Economy Affairs and Energy. 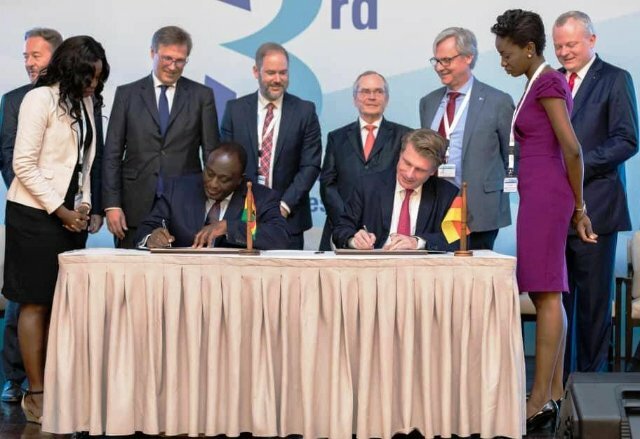 The signing ceremony which took place at the margins of the 3rd German – African Business Summit at the Kempinski Gold Coast City Hotel was witnessed by senior government and business executives from both Ghana and Germany. The German-Ghanaian Business Council has been established as a framework for facilitating economic cooperation, and promoting bilateral trade and investment between the two countries. Speaking in an interview, the Trade Minister, indicated that the role of the Council will, among other things, be to identify business opportunities, trade and investment related activities that could be exploited by both countries for the enhancement of bilateral economic, trade and investment cooperation. Mr. Alan Kyerematen was optimistic that Ghanaian SMEs will emulate the core competences of the German SMEs and also to leverage the research and innovation of German businesses through strategic partnerships. Also, the Trade Minister participated in the High Level Panel Discussion on how Africa can transform the 21st Century into Africa’s Century stated that the Council will hold consultations on specific trade and investment matters of mutual interest. He stressed that, that the Council will identify specific constraints to mutual trade, investments and economic cooperation and collaborate on addressing those constraints under this structured approach.